Bonner-Weir S and O’Brien TD (2008). Islets in type 2 diabetes: In honor of Dr. Robert C Turner. Diabetes 57, 2899-2904. DeFronzo RA (2015). Banting Lecture. From the triumvirate to the ominous octet: a new paradigm for the treatment of type 2 diabetes mellitus. Diabetes 58, 773-795. DiPaola RS (2002). To arrest or not to G(2)-M cell-cycle arrest: commentary re: AK Tyagi et al., Silibinin strongly synergizes human prostate carcinoma DU145 cells to doxorubicin-induced growth inhibition, G2-M arrest, and apoptosis. Clin Cancer Res 8, 3311-3314. Foltz DR et al. (2006). The human CENP-A centromeric nucleosome-associated complex. Nat Cell Biol 8, 458-469. Fu Z et al. (2008). Plk1-dependent phosphorylation of FoxM1 regulates a transcriptional programme required for mitotic progression. Nature Cell Biol 10, 1076-1082. Kishi K et al. (2009). Functional dynamics of polo-like kinase 1 at the centrosome. Mol Cell Biol 29, 3134-3150. Maedler K and Donath MY (2004). Beta-cells in type 2 diabetes: a loss of function and mass. Horm Res 62 Suppl 3, 62-73. Matveyenko AV and Butler PC (2008). Relationship between beta-cell mass and diabetes onset. Diabetes Obes Metab 10 Suppl 4, 23-31. McKinley KL and Cheeseman IM (2014). Polo-like kinase 1 licenses CENP-A deposition at centromeres. Cell 158, 397-411. Pagliuca FW et al. (2014). Generation of functional human pancreatic β cells in vitro. Cell 159, 428-439. Raychaudhuri P and Park HJ (2011). FoxM1 a master regulator of tumor metastasis. Cancer Res 71, 4329-4333. Rezania A et al. (2014). Reversal of diabetes with insulin-producing cells derived in vitro from human pluripotent stem cells. Nat Biotechnol 32, 1121-1133. Sims EA et al. (1973). Endocrine and metabolic effects of experimental obesity in man. Recent Prog Horm Res 29, 457-496. Shirakawa J et al. (2017). Insulin signaling regulates the FoxM1/PLK1/CEENP-A pathway to promote adaptive pancreatic β cell proliferation. Cell Metab 25, 868-882. Vetere A and Wagner BK (2012). Chemical methods to induce beta cell proliferation. Int J Endocrinol 2012, 925143. Wang IC et al. (2005). Forkhead box M1 regulates the transcriptional network of genes essential for mitotic progression and genes encoding the SCF (Skp2-Cks1) ubiquitin ligase. Mol Cell Biol 25, 10875-10894. Wierstra I (2013). FOXM1 (Forkhead box M1) in tumorigenesis: overexpression in human cancer, implication in tumorigenesis, oncogenic functions, tumor-suppressive properties, and target of anticancer therapy. Adv Cancer Res 119, 191-419. World Health Organization (2016). Global report on diabetes, pp 12. http://apps.who.int/iris/bitstream/10665/204871/1/9789241565257_eng.pdf, accessed August 2, 2017. Xie M et al. (2016). β-cell-mimetic designer cells provide closed-loop glycemic control. Science 354, 1296-1301. In 1973, Sims et al. coined the term “diabesity” in recognition of the association between obesity and the development of diabetes (Sims et al. 1973). Today, there is a clearly established link between obesity, insulin resistance, and type 2 diabetes mellitus (T2D) (DeFronzo 2015). In fact, obesity and being overweight are the strongest risk factors for T2D (World Health Organization 2016). The development of insulin resistance at the onset of obesity is a precursor to T2D. The body compensates for this lack of response to insulin by increasing the number of insulin-producing beta cells in the pancreas through cell proliferation mechanisms. However, in individuals that ultimately develop T2D, these beta cells first lose their proliferative capacity before becoming quiescent and unable to produce insulin (Maedler and Donath 2004). Increased beta cell apoptosis rates have also been reported in the scientific literature (Bonner-Weir and O’Brien 2008). However, this observation has been contested, as in some studies increased beta cell apoptosis could not be observed (Bonner-Weir and O’Brien 2008). Despite the ongoing debate around apoptosis, the reduction in beta cell mass seems to be characteristic of T2D, although accurate beta cell quantification methods in humans are not yet available (Matveyenko and Butler 2008). However, the molecular and cell signaling mechanisms responsible for the sudden failure of beta cells to proliferate in T2D patients have long since perplexed diabetes researchers. Scientists are currently investigating various strategies to induce quiescent adult beta cells to re-enter the cell cycle, mature, and ultimately produce insulin. These include the use of small molecule drugs that induce beta cell regeneration (Vetere and Wagner 2012) as well as the stimulation of stem cells to mature into beta cells (Pagliuca et al. 2014, Rezania et al. 2014, Xie et al. 2016). These approaches are based on the hypothesis that increasing beta cell numbers in obese individuals could prevent or treat obesity-induced T2D. While these strategies show significant promise, none have been successful in treating T2D patients. A recent study by scientists at the Joslin Diabetes Center in Boston Massachusetts USA therefore returned to the fundamental question at the center of T2D, which is why beta cells fail to proliferate in T2D patients (Shirakawa et al. 2017). To address this question, beta cells derived from beta cell specific insulin receptor knock out mice (βIRKO mice) that are unable to proliferate as normal beta cells were used. The research team observed a significant reduction in centromere protein A (CENP-A) and polo-like kinase-1 (PLK1) gene and protein expression levels in insulin receptor knockout beta cells compared to normal beta cells, as assessed by immunohistochemistry and western blotting (Shirakawa et al. 2017). This result was confirmed in human cells, as beta cells from T2D donors have reduced levels of these two proteins compared to beta cells from healthy individuals (Shirakawa et al. 2017). CENP-A and PLK1 are involved in orchestrating mitosis. They are key players in the G2/M checkpoint, which determines whether a cell progresses to mitosis and becomes mature or initiates cell death (DiPaola 2002). CENP-A is necessary for recruitment and assembly of kinetochore proteins and chromosome segregation during mitosis (Foltz et al. 2006). PLK1 on the other hand is important for depositing CENP-A at the centromere (McKinley and Cheeseman 2014). It also phosphorylates critical proteins for cytokinesis as well as mitotic spindle formation (Kishi et al. 2009). Mice with a beta cell specific knockout of CENP-A (βCenpaKO) could not compensate for insulin demand induced by pregnancy or aging through promotion of beta cell proliferation (Shirakawa et al. 2017). In addition, βIRKO cells treated with a PLK1-specific inhibitor (BI-2536) demonstrated reduced cell proliferation. This highlights the important role of CENP-A and PLK1 in generating beta cells. To further understand how CENP-A and PLK1 are regulated during insulin signaling, the research team investigated the role of the transcription factor forkhead box protein 1 (FoxM1), a direct regulator of PLK1 gene expression (Shirakawa et al. 2017, Wang et al. 2005). FoxM1 not only regulates PLK1 levels, but its transcriptional activity is mediated by PLK1 induced phosphorylation, thereby creating a positive feedback loop (Fu et al. 2008). Shirakawa et al. (2017) demonstrated that insulin signaling promotes DNA binding of FoxM1 to induce CENP-A and PLK1 expression in beta cells by chromatin immunoprecipitation (ChIP) analysis. In a complementary experiment, the researchers also showed reduced binding of FoxM1 to CENP-A and PLK1 promoters in insulin receptor knock out beta cells (Shirakawa et al. 2017). The cell cycle checkpoint proteins cyclin-dependent kinase 1 and 2 (CDK1, CDK2) were also shown to be involved in the FoxM1/CENP-A/PLK1 pathway in beta cells (Shirakawa et al. 2017). In a high-fat diet induced mouse model of T2D, significant decrease in CDK1 and CDK2 expression was observed (Shirakawa et al. 2017). The research team demonstrated that in normal beta cells, CENP-A is kept inactive by CDK1 and CDK2 during the S and G2 phases of the cell cycle (Shirakawa et al. 2017). However, in early mitosis, CDK1 phosphorylates CENP-A, to initiate mitotic exit (Shirakawa et al. 2017). CDK1 also phosphorylates an activator of the PLK1 protein called SPAT-1 to regulate mitotic entry (Shirakawa et al. 2017). This demonstrates that CDK activity is essential for cell-cycle progression in beta cells through regulation of CENP-A and PLK1. The reduced expression of these proteins in T2D therefore contributes to the inability of beta cells to proliferate (Shirakawa et al. 2017). 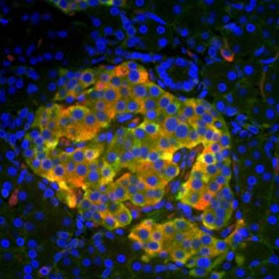 This cutting-edge study not only provides a biological understanding of why beta cells fail to proliferate in T2D patients, but also offers potential targets for developing therapeutic solutions. With the rising incidence of obesity worldwide and the prevalence of associated T2D, this study is timely and could have a major global health impact (World Health Organization 2016). Based on the research findings, it is possible that FoxM1 or other proteins in the identified pathway could be targeted therapeutically to induce beta cell proliferation in T2D patients. In addition, CENP-A and PLK1 could serve as biomarkers for the development of precision medicine approaches to T2D treatment. FoxM1 is also overexpressed in tumors (Raychaudhuri and Park 2011). It is involved in epithelial to mesenchymal transition in cancer, cell migration, and tumorigenicity, which underscores its key role in regulating tumor metastasis (Wierstra 2013). Therefore, therapies developed to target FoxM1 for T2D treatment, could also be useful for cancer therapy. Check out our in-depth mini-review which provides a biological and experimental overview of the eukaryotic cell cycle. If you are analyzing cell proliferation rates, here are some common methods we suggest for meaningful results. Newly synthesized DNA, a key indicator of cell proliferation, can be detected using thymidine analogs. These chemicals are incorporated into DNA during the S phase of the cell cycle instead of thymidine. One commonly used analog is 5′-bromo-2′-deoxyuridine (BrdU), which can be visualized with the help of specific anti-BrdU antibodies, such as Mouse Anti-BrdU Antibody (clone Bu20a) and Rabbit Anti-BrdU Antibody (AHP2405). Hoechst 33342 is commonly used. Biological and Experimental Overview”). Therefore, they serve as cell proliferation markers. Antibodies raised against these proteins allow distinction of actively dividing versus quiescent cells in various applications.